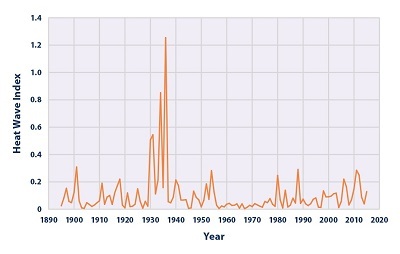 ﻿ Fun Easy English - Environment - Global warming - Climate change Indicators: High and Low Temperatures. Unusually hot or cold temperatures can result in prolonged extreme weather events like summer heat waves or winter cold spells. 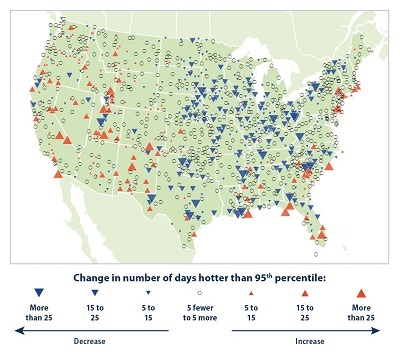 Heat waves can lead to illness and death, particularly among older adults, the very young, and other vulnerable populations (see the Heat-Related Deaths and Heat-Related Illnesses indicators). People can also die from exposure to extreme cold (hypothermia). In addition, prolonged exposure to excessive heat and cold can damage crops and injure or kill livestock. 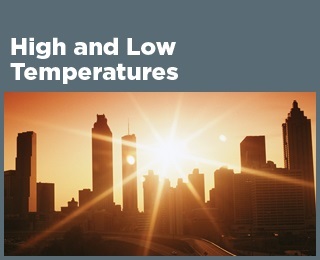 Extreme heat can lead to power outages as heavy demands for air conditioning strain the power grid, while extremely cold weather increases the need for heating fuel. 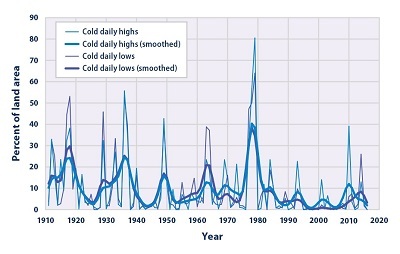 Record-setting daily temperatures, heat waves, and cold spells are a natural part of day-to-day variation in weather. 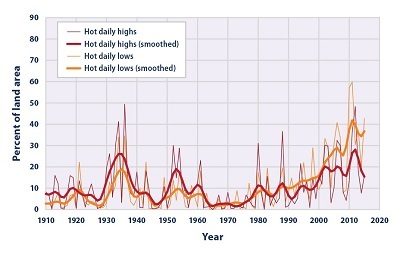 As the Earth’s climate warms overall, however, heat waves are expected to become more frequent, longer, and more intense. Higher heat index values (which combine temperature and humidity to describe perceived temperature) are expected to increase discomfort and aggravate health issues. Conversely, cold spells are expected to decrease. 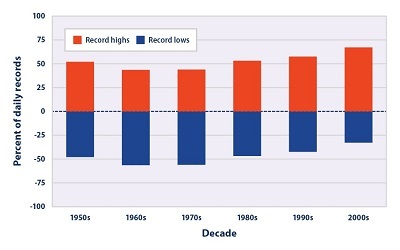 In most locations, scientists expect daily minimum temperatures—which typically occur at night—to become warmer at a faster rate than daily maximum temperatures. 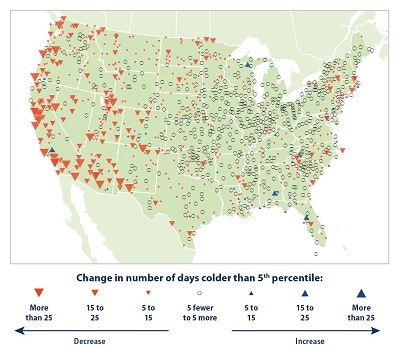 This change will provide less opportunity to cool off and recover from daytime heat.